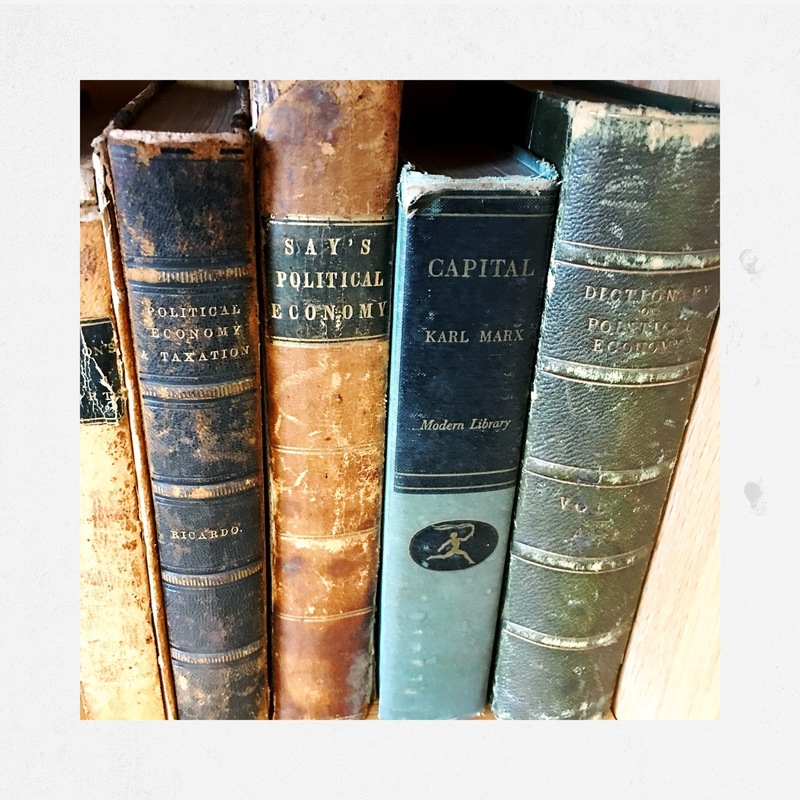 Marx's capital (Volume 1) was published September 14, 1867, exactly 150 years ago. Below a few links to posts on Marx written over the years. 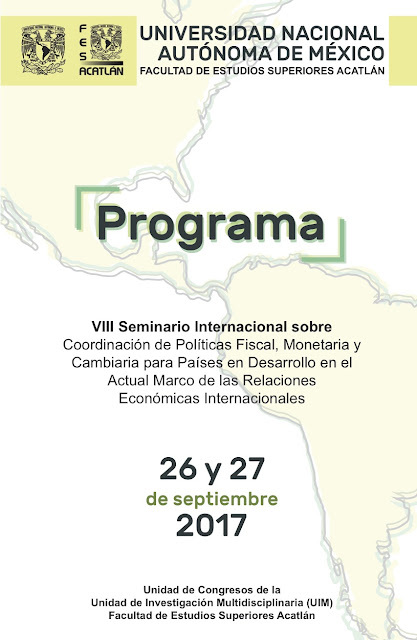 The 8th international seminar on Coordination of Fiscal, Monetary and Exchange Rate Policies in Developing Countries at the Universidad Nacional Autónoma de México, Facultad de Estudios Superiores Acatlán (UNAM-FES-Acatlán) will take place later this month. Ignácio Perrotini and I will give the opening talks the 26, and Ariel Dvoskin the following day. Many local economists will present too, like Flor Brown, Lilia Domínguez, Noemí Levy, Teresa López, and Luis Ángel Ortiz to name a few. Will post a link to the program soon. A graph that shows, for a longer span, essentially the same information presented in Robert Allen's graph of manufacturing production, and discussed before here. It is evident that the rise of China (India is not quite yet visible, even if its share did increase) represents a certain rebalancing, which is inevitable as the income per capita grows in that country, even if it does not scape what mainstream economists refer to as the middle income trap. Source here, and the data is, as expected from Maddison. 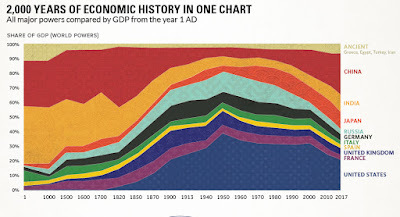 Note that the first millennia, where Asia (China and India essentially) is much smaller in terms of the graph, which is a result of the paucity of data. 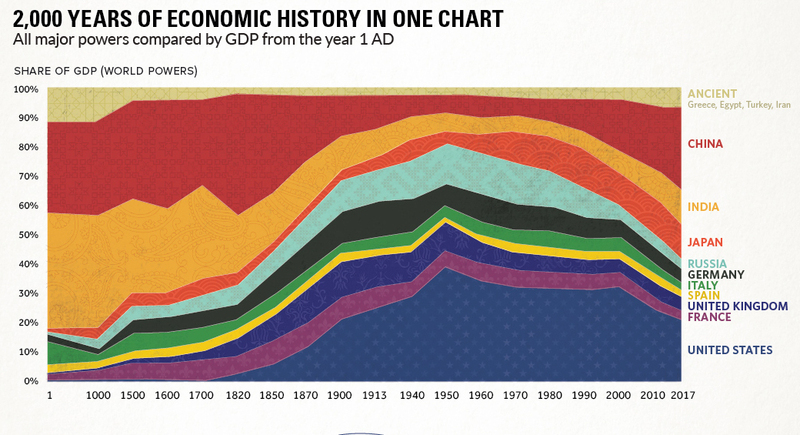 In a sense, the graph shows the relatively brief rise, and now relative decline of Western GDP dominance, as Asia regains a space more proportional to its population share. PS: On issues with GDP measures see here. 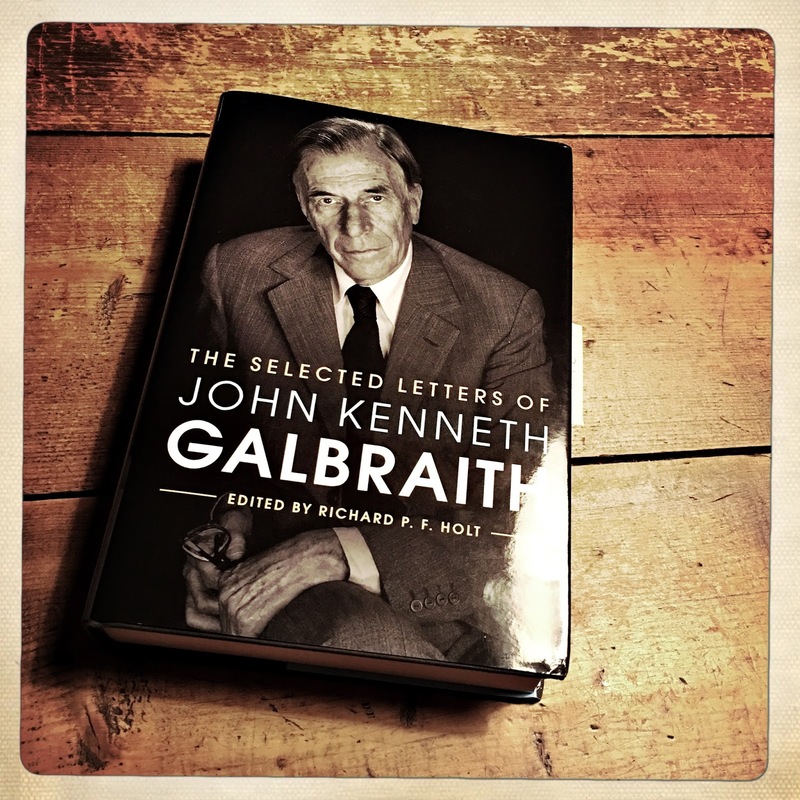 Rick Holt edited a superb book with John Kenneth Galbraith's letters from the 1930s until his death in 2006. He wrote to everybody, friend and foe, and displays his usual wit. Here I reproduce parts of his letter to Joan Robinson, that he wrote after having invited her to give the Ely Lecture (subscription required). The president of the Association, as I think I said once in New Orleans, has powers closely paralleling the President of Italy, but perhaps less. Indeed this is the way in which all establishments maintain themselves. One diffuses power through people who are reliably like of mind. But I hope to have some slight influence on the Journals, and I'm going to make a particularly determined effort to revise hiring practices in the profession... A good deal has been done in the past couple of years to put the problems of the black and Spanish-speaking minorities on the professional conscience. Discrimination against women remains in some degree the most blatant. Would you... write me a little more complete observation and complaint... Sometimes the knowledge of an unsatisfied clientele produces some results. I was lucky to see Galbraith give a talk (subscription required) at the New School back in November 1998. Great book. Buy two copies! Don't be evil was, of course, Google's motto. The New York Times had a piece recently on the firing of Barry Lynn from the New America Foundation, a Democratic think tank that, if memory doesn't fail me, was at least initially connected to the Clintons. The whole thing resulted from the fact that Lynn was favorable to the European Union regulation of Google, a major donor to the think tank. Given that I've been writing about the influence of corporate money in academia, I thought it was a good idea to link to this other story about Google's perverse influence in the public debate. In my view, Google is not on the cancer-denying or climate-change-denying business simply as a result of a market structure phenomena. And in many ways Google and Facebook (don't get me wrong Amazon is also dangerous, but in a different way, they still sell stuff, whereas the other two sell your information), or Big Internet, are more dangerous than Big Tobacco and Big Oil. I posted recently on the increasing influence of corporate money in academia, specifically the new Marriner Eccles center funded by the Koch brothers at the University of Utah. The piece by David V. Johnson in the Baffler on this subject is worth reading. As he notes, the new breed of private money goes beyond what they used to do in the past, trying to directly influence what kind of research, the curriculum and what ideas should be disseminated, and, indirectly who should be hired and retained. This is all the more problematic in the context of the retreat of public funding and the rise of the the corporate university, which implies that increasingly money equals voice in academia. private funding that burrows within the very body of public institutions, the better to influence related departments and curricula across the university. One of the examples discussed is a center that is an offshoot, in a sense, of the Mercatus Center at George Mason University, which was at the heart of the discussion of James Buchanan and the Kochs in Nancy MacLean's Democracy in Chains (reviewed here by Heather Boushey). I'm not particularly interested in the details, but what I think is relevant is that the push for free market fundamentalism is seen as a quest for "spreading what he called 'diversity of thought' at universities across the land." You would think that Economics Departments in the US are dominated by Marxists or other types of Radicals. In all fairness, there are only four graduate heterodox programs in the US and a few Liberal Arts Schools that still have heterodox economists. If anything it seems that it's more likely that studying economics, in US universities, would make you more conservative (The New York Times said Republican citing the same study) and favorable to free markets. And others suggest that it can make you more selfish. Don't get me wrong, I'm for diversity of views, pluralism if you prefer the term, but pro-market views are well represented in academia. The Economist new series on 'big ideas' tackled in a recent issue the concept of the natural rate unemployment (subscription required; other ideas included Say's Law and Human Capital, just to give you the broad picture of what they think it's big). I will only comment very briefly on two issues, one related to the history of ideas and the other to the concept itself. John Maynard Keynes, the great British economist, took a first step towards the natural-rate hypothesis when he focused minds on 'involuntary' unemployment. In his book 'The General Theory'. The idea of a natural rate of interest can be clearly traced back to marginalist economics, and was a central concept discussed by Knut Wicksell. The idea of the natural rate of unemployment, as The Economist correctly points out, is essentially related to Milton Friedman's American Economic Association Presidential address of almost half a century ago, and the Monetarist interpretation of the Phillips Curve (PC). However, Keynes' Wicksellian days were over by about 1932, when in the aftermath of the Circus discussions, he abandoned the theoretical framework of the Treatise on Money and started on his way to effective demand and the General Theory (GT). Note that the idea of a natural rate of interest is intrinsically connected to the natural rate of unemployment, since the former would be the rate of interest that corresponds to full employment and stable prices, meaning the equilibrium in the labor market. ... it was a mistake to speak of the natural rate of interest or to suggest that the above definition would yield a unique value for the rate of interest irrespective of the level of employment. I had not then understood that, in certain conditions, the system could be in equilibrium with less than full employment. I am now no longer of the opinion that the concept of a 'natural' rate of interest, which previously seemed to me a most promising idea, has anything very useful or significant to contribute to our analysis. ... to reject the natural rate entirely, you would need to believe one of two things. Either central banks cannot influence the rate of unemployment even in the short term, or they can peg unemployment as low as they like—zero, even—without sparking inflation. Neither claim is credible. Inflation, more often than not, is a cost push phenomenon associated to higher prices of commodities, devalued exchange rates, and more social conflict reflected in higher wage resistance. So, lower unemployment would eventually strengthen the labor force, and would lead to higher wages, and that combined with possible sectoral shortages of raw materials, which would also be more expensive, would lead to inflation. So you might very well get inflation before you reach zero unemployment rate, but the reasons are not the ones the magazine authors think. The point is that there is no reason to think that there is one level of unemployment that magically would lead to inflation. No natural rate, but several possible rates of unemployment compatible with stable prices, depending on a whole set of social and institutional conditions. 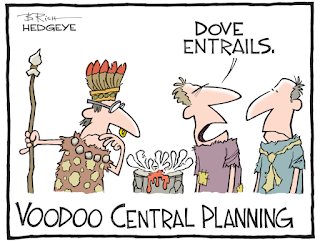 And the central bank can affect unemployment, even if its ability is not straightforward and is asymmetrical. In a recession, a lower rate of interest is, as Eccles famously said (he really popularized the phrase, but he did not coin it), like pushing on a string. You need fiscal spending in that situation, as has been painfully obvious during the long Obama recovery. But in a boom a hike to the rate of interest, in particular if it affects debtors, might cause a recession. So The Economist is wrong (I'm shocked, shocked!). You can believe that central banks affect unemployment and that there is some inflation barrier, but that does NOT mean that there is a natural rate. Interestingly enough, they do admit that they (and economists in general) have no clue what is the correct natural rate of unemployment, and that should make the natural rate concept of limited usefulness for policymakers. 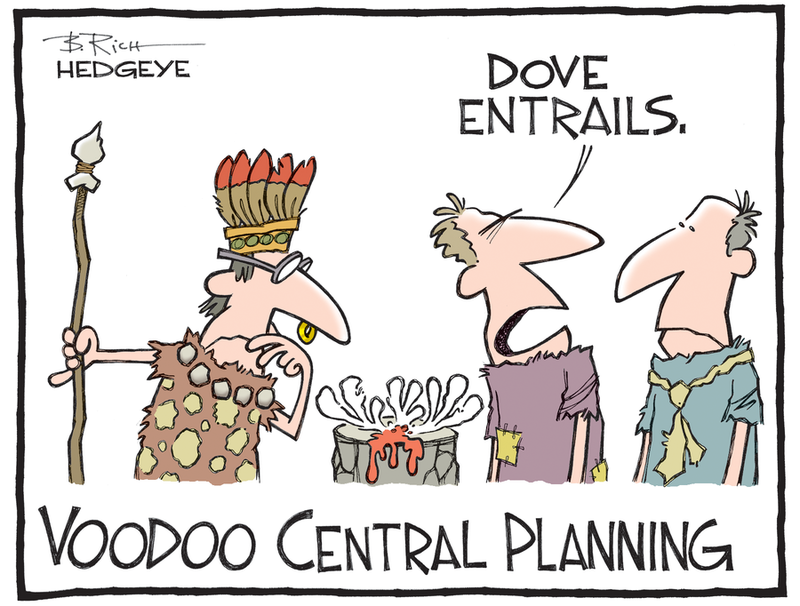 So what they propose central banks should do? Use a flawed concept that cannot be measured as the guide for policy? That's some serious thinking, isn't it? * Too many posts on the problems with the natural rate have been discussed over the years in this blog, just click on the hashtag and check a few if you're interested. ** Note, also, that when demand goes up, firms do invest to adjust capacity, which means that the capacity limit is not fixed either.